The following is a guest written post from one of the early childhood educators at our centre, Yoon Ji (Amy) Kim. To learn more about Amy, visit our staff directory here! The hundred languages of children are expressed through another hundred ways. There are no ordinary moments with the children. If we think slightly different, it sets a totally different mood, rhythm, tone, and dynamic to the situation which makes it more valuable and extendable. We are not educating children to have a just ‘fun’ or ‘happy’ day. Yes, those are important factors in the day yet we thrive to be with children when they are having ups and downs and letting them understand that we are there with them and here is the safe space to express who they are. The children and the educators are learning together, not to be ready for school, but to know how to co-exist together physically, mentally, socially, and spiritually. We value the wholeness of the child not ones we like about child but the whole child. The pedagogy is a difficult concept to fully understand yet it is flexible to be inclusive to all children, families, and educators. We think about how to be with the child. Often we might think we are doing for the child, to the child, and of the child, but we are reflecting our work to be with the child in our daily inquiries. We value children’s differences through pedagogical listening, this is an active listening. Active listening is to be present not just physically in the room but truly participating and attentively being WITH children. The child may be our hundredth child that comes through the door but we, educators can be the child’s first or second, less than the tenth educator. We may be their first teacher ever. How important are we? Their educational years can start differently. We may be the beginning of their journey. Through pedagogical narrations and documentation, we express our care, hospitalities, and respect for children’s words, actions, creations, and play. 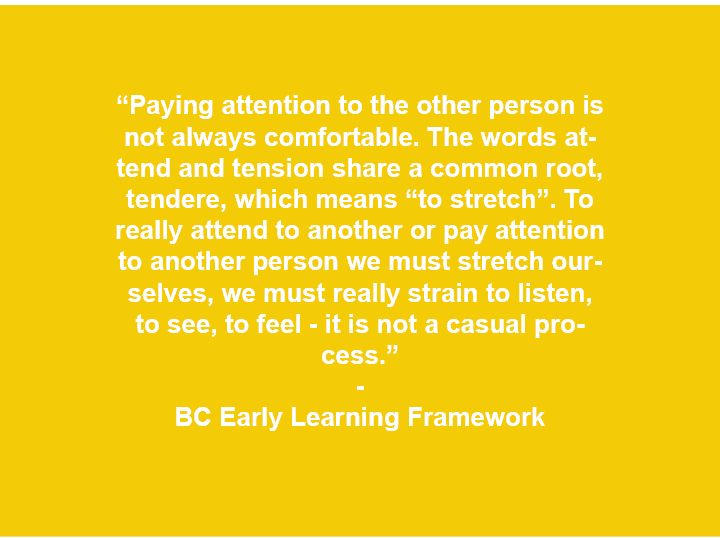 We deeply resonate with the BC Early Learning Framework when we present ourselves to the children, families, and the communities. Demonstrate pedagogical practices that are connected to contemporary theoretical approaches to learning, thinking and teaching in the field of early childhood care and education. Work collaboratively with children, families, educators, and community to provide relevant and responsive caring and educational experiences. We use ethical pedagogical practices that demonstrate an understanding and sensitivity of each child. We like to think the true care is the gift exchange, the children gift the room, others, and educators with their gaze, smile, creations, expressions, and actions. And we, educators send back the gift to the children with respondents of expressions. The above is inspired by the BC Early Learning Framework and written by Yoon Ji (Amy) Kim. Parkland Players was established in 1995 to fill a community need for quality daycare and education. Our child care centers have been founded on the philosophy that children, their families and the community benefit from high quality Early Childhood Programs. We strive to allow each child to openly explore their individual interests through a variety of programs. Over the years, we have been active members of our Coquitlam Community by taking part in various community events. © 2019 Parkland Players - Coquitlam Child Care Center - Group Daycare, Infant Toddler, Reggio Emilia Approach, Before After School Care.